Leoš Janáček's harrowing drama of Czech village life returns. 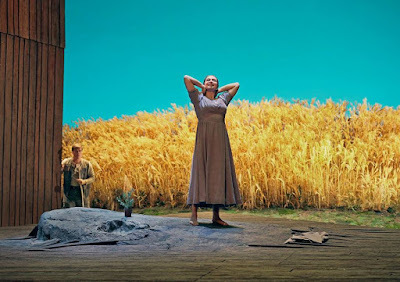 Oksana Dyka in the title role of Jenůfa, opening at the Met on Oct. 28.
his bucolic tragedy is one of Janáček's masterpieces and the opera tht made the Czech composer a sensation late in life. The Met outdoor broadcast series does Il Trovatore. 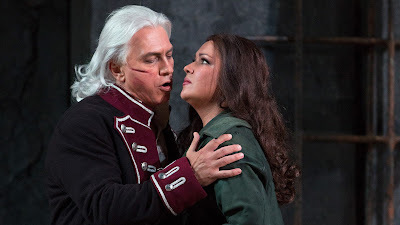 Passions writ large: Dmitri Hvorostovsky (left) woos Anna Netrebko in Act IV of Il Trovatore. Photo © 2016 The Metrropolitan Opera. Not every opera reviewer can see every important revival at the Metropolitan Opera. (It's even harder when that house continues its practice of keeping hard-working bloggers out of its press seats.) A major gap was corrected last night when this writer finally got a chance to see last year's searing revival of Il Trovatore, with Anna Netrebko, Dmitri Hvorostovsky, Dolora Zajick and Younghoon Lee squaring off in Verdi's most passionate opera. 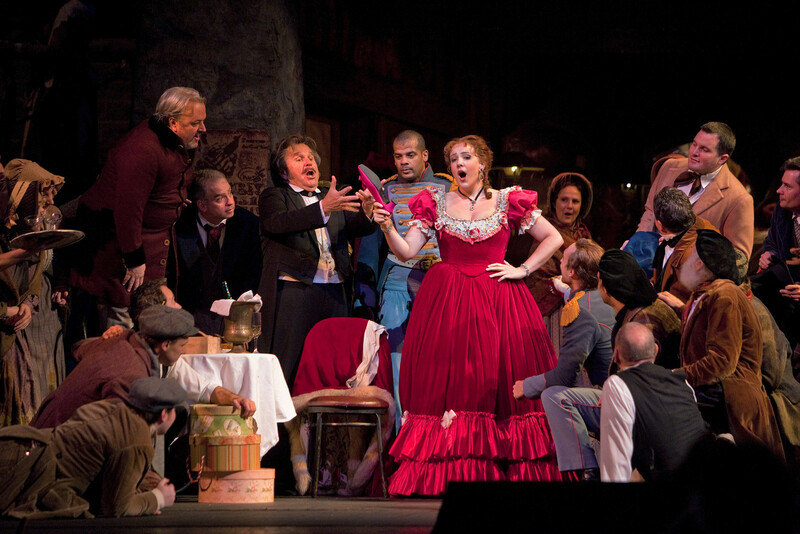 Il Trovatore is a repertory staple, but one that is hard to bring off as a full success. Under the baton of Marco Armiliato, this quartet of singers succeeded. Mozart's high-speed comedy of domestic chaos yields infinite rewards. 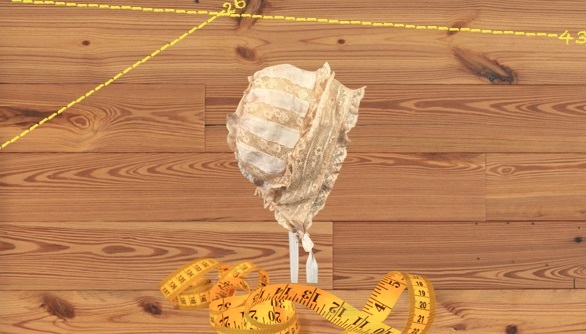 The measuring tape and bonnet from the opening scene of The Marriage of Figaro. Image collage by the author. 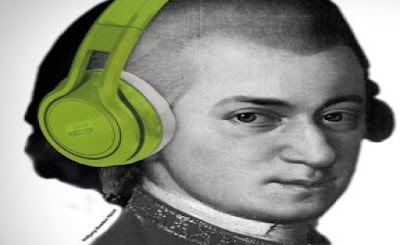 It was really hard to start writing this newest Superconductor Audio Guide devoted to five great recordings of Mozart's Le Nozze di Figaro. It is an opera that (for this writer anyway) cures all ills. Not only does this mix of genuine pathos and knockabout comedy have some of Mozart's most sublime writing for the voice, but its message that the little guy can have his day and defeat the evils of patriarchy and patronage still resounds, inspired and comforts listeners today. Burnt Sugar Arkestra throws a Parade at Lincoln Center. 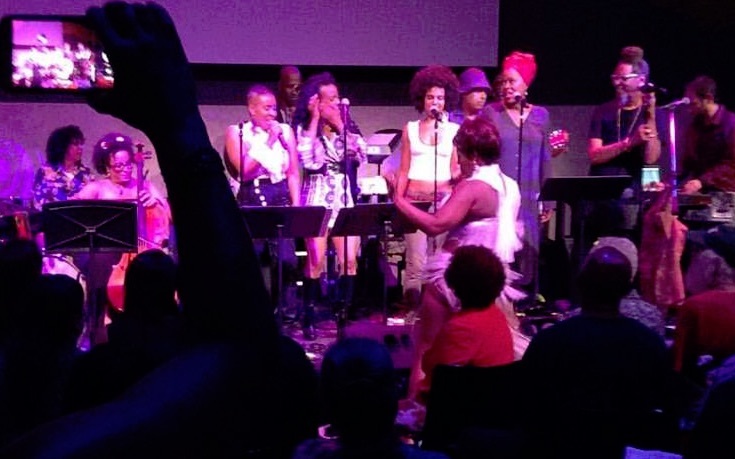 Members of Burnt Sugar the Arkestra Chamber paint Lincoln Center purple. Photo anonymous, from the group's Facebook page. © 2016 Burnt Sugar Arkestra. It was a wake, a gospel revival, and a celebration of the life of an American musical genius. Last night, Burnt Sugar the Arkestra Chamber played a free concert in the David Rubenstein Atrium at Lincoln Center, with all sixteen musicians and singers delivering a smoking and soulful tribute to one Prince Rogers Nelson, the Minneapolis singer, songwriter, composer and multi-instrumentalist whose death earlier this year rocked an already reeling and shuddering world. Dell'Arte Opera Ensemble mounts Massenet's Manon. Photo by Mark Baker for Dell'Arte Opera Ensemble. When presenting the classic opera repertory, sometimes it is good to do a lot with very little. 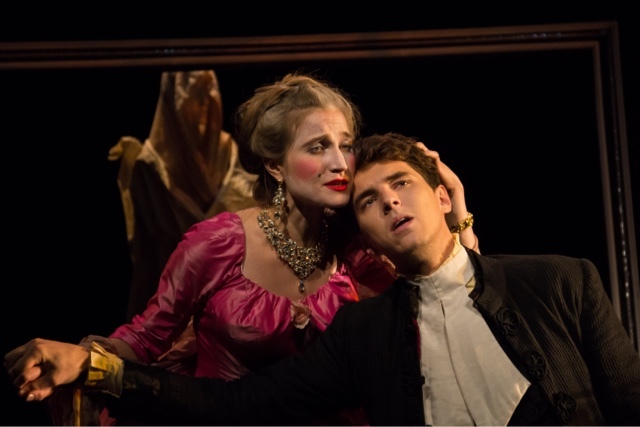 That is the mantra behind this handsome but economical staging of Massenet's Manon, currently running at the Nagelberg Theater, located deep within CUNY's Baruch College. This Manon is part of Dell'Arte Opera Ensemble's ongoing summer festival. Traditional in its costuming and yet modern in the staging approach of director Victoria Crutchfield, it proved a satisfying experience on Monday night. Mostly Mozart goes to church...twice. Photo © 2016 Mostly Mozart Festival/Lincoln Center for the Performing Arts. Four singers made their debuts at the Mostly Mozart Festival on Friday night, singing two major choral works by the Austrian composer: the Mass in C minor and the Requiem. Both compositions were begun at key moments in Mozart's tumultuous life. Due to extenuating circumstances, each of these grand choral compositions was left unfinished. 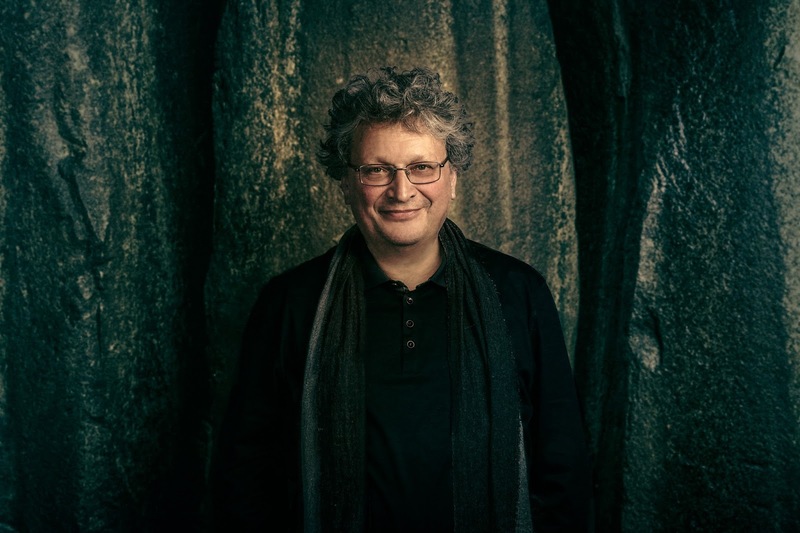 René Jacobs offers a fresh take on Mozart's Idomeneo. courtesy Lincoln Center Press Department. It is rare to attend a performance with the potential to revamp an entire city's attitude toward a great but neglected piece of classical music. 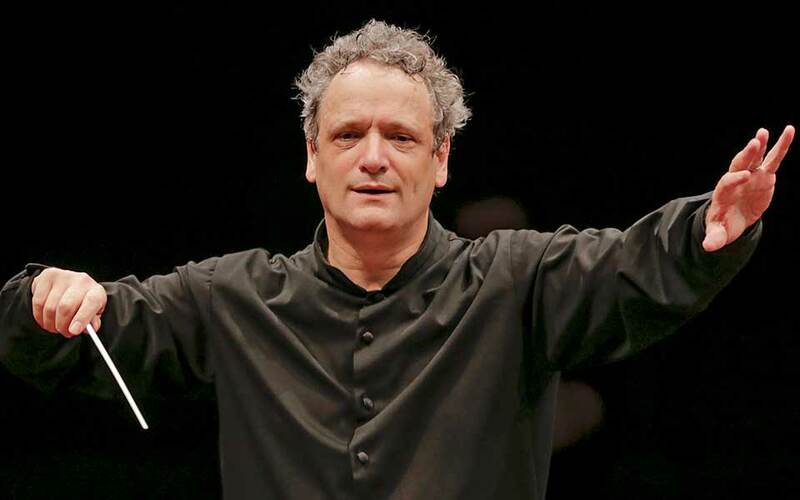 On Thursday night at Alice Tully Hall, the Mostly Mozart Festival welcomed historically informed performance expert and conductor René Jacobs, the Freiburg Baroque Orchestra, the Arnold Schoenberg Choir and a strong cast of lesser-known soloists, most of them in their Mostly Mozart Festival debuts. Their job: a concert performance of Idomeneo, the no-foolin' three-act operatic masterpiece that Mozart wrote at the age of 25. Yannick Nézet-Séguin records Le Nozze di Figaro. Cover art for the new DG recording of Le Nozze di Figaro. © 2016 Deutsche Grammophon/Universal Classics. Le Nozze di Figaro is one of the most frequently performed and recorded Mozart operas. It's the one with everything: meaty roles for two baritones and two very different leading ladies, a plum comic part for a bass worth his salt and an opportunity for a star conductor to prove himself by keeping the action moving and the many ensembles rolling along. It also helps a listener learn much about a conductor's style in general, thanks to the many different demands this four-hour opera makes. Mozart's singspiel put German opera on the map. 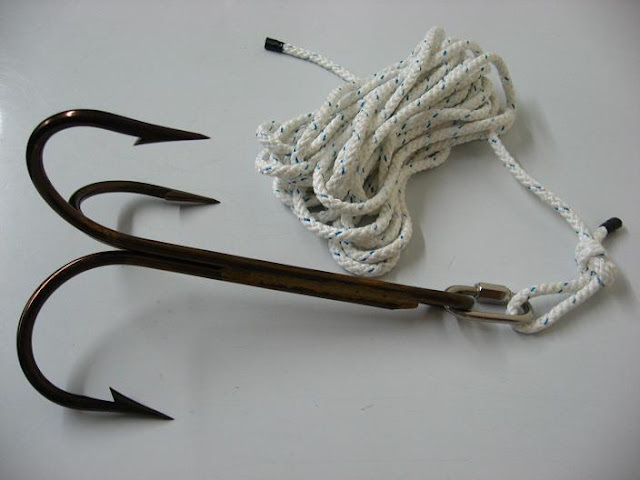 The grappling hook: essential equipment for any staging of Die Entführung aus dem Serail. In 1781, the Austro-Hungarian Emperor Joseph II wanted to promote singspiel (German opera with spoken dialogue instead of recitative) as an alternative to the Italian opera that dominated the stage in the 18th century. He decreed the founding of the Nationalsingspiel, a company dedicated to performance of Gernab opera. Its first and most enduring production was Mozart's 1782 opera Die Entführung aus dem Serail ("The Abduction from the Seraglio.") It is the earliest of the composer's German operas to hold a continued place in the standard international repertory, and the oldest German opera that is regularly heard today. Mostly Mozart tours the composer's symphonies. Fifty years ago, Mostly Mozart was born. Its mission: bring Mozart's music to Manhattanites in the dog days of summer. The idea of an indoor (and air-conditioned) summer festival proved popular with concert-goers. In recent years, the Festival has veered from this mission, incorporating Beethoven and even Brahms in its programming. 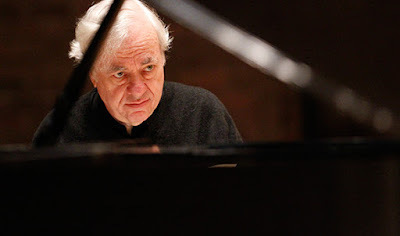 However this week's program, conducted by Louis Langrée and featuring New York-based pianist Richard Goode was true to the original mission: it was all Mozart. Yes return to New York for this critic's "night off." unlock the secrets of the universe at the St. George Theater on Staten Island on Tuesday night. Photo (with an iPhone 6) by the author. The British progressive rock band Yes returned to New York City on Tuesday night, with a three-hour show at the St. George Theater, a gorgeous 1929 palace located on Staten Island just a short climb from the Staten Island Ferry. 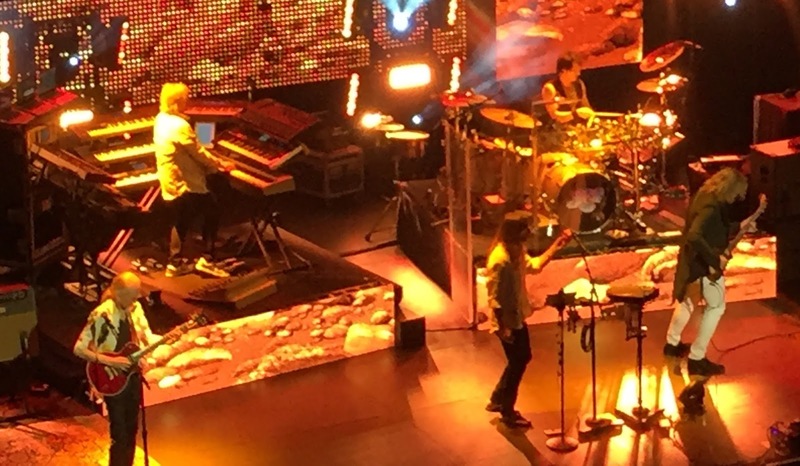 The band's current show featured two whole sides of their 1973 opus Tales from Topographic Oceans and the entire Drama album, a 1980 record that has been largely forgotten by fans. The Met brings back its meal ticket featuring four starving artists. If the shoe fits...Susanna Philips (center) as Musetta in a scene from Act II of La Bohéme. Photo by Cory Weaver © 2016 The Metropolitan Opera. A brace of young, talented tenors, sopranos and baritones portray Puccini's Paris bohemians, trying to stay warm through a long cold winter and a massive Act Three cascade of fake stage snow. This is the Met's most-performed and most revived show, back for another year. Le Villi and La Navarraise at the Bard Festival. 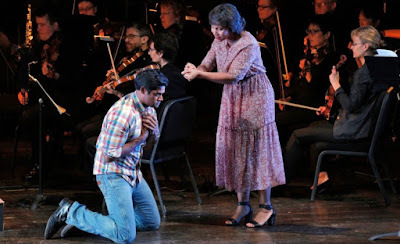 Sean Pannikar (left) and Talise Trevigne in a tense moment from Puccini's Le Villi. Photo by Cory Weaver © 2016 Bard Music Festival. This summer's Bard Music Festival is focused almost entirely on the music of Giacomo Puccini, the Italian opera composer who stands at the end of a four hundred-year tradition of opera as that country's dominant art form. From his early competition pieces to the unfinished wonders of his final opera Turandot, Puccini was the climax of a long line of composers and somehow the end of the road. Sense, sensibility and yes, sea monsters in Mozart's mythic drama. 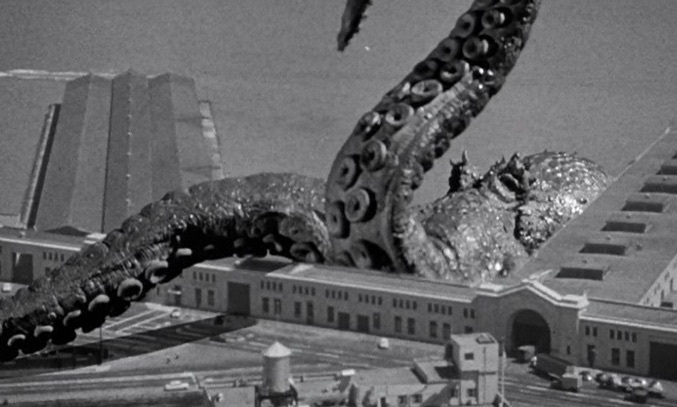 Image from the 1955 Ray Harryhausen picture It Came From Beneath the Sea. © 1955 Clover Productions Incorporated. In the year 1780, when Wolfgang Amadeus Mozart was 24 years old, he accepted a commission from the Elector of Bavaria to write a new opera for Carnival season the following year. The result was Idomeneo, re di Creta, his thirteenth opera and the earliest of his stage creations to retain a place in the standard repertory of the world's opera houses. Sprawling over three acts, this is a work of exceptional musical ambition and challenge to its performers, as it was created for the formidable orchestra and cast that were at the Elector's disposal. Paavo Järvi and Martin Fröst at Mostly Mozart. 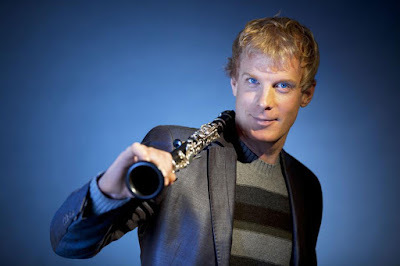 The man and his horn: clarinetist Martin Fröst. The Mostly Mozart Festival Orchestra got a chance to flex its musical muscles on Friday evening. They played the Clarinet Concerto by their namesake composer, bracketed by works from Arvo Pärt and Ludwig van Beethoven. This week’s guest conductor was Paavo Järvi, eldest son of the conductor Neeme Järvi and (like his father) a versatile maestro with respectable international credentials. The Met opens its season with Wagner's transcendental tragedy. 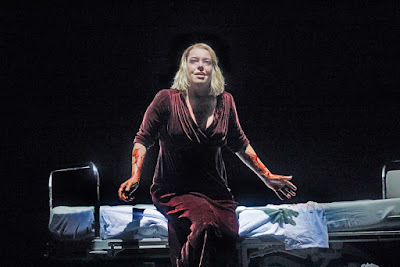 Nina Stemme is Isolde in the Met's new production of Wagner's Tristan und Isolde. 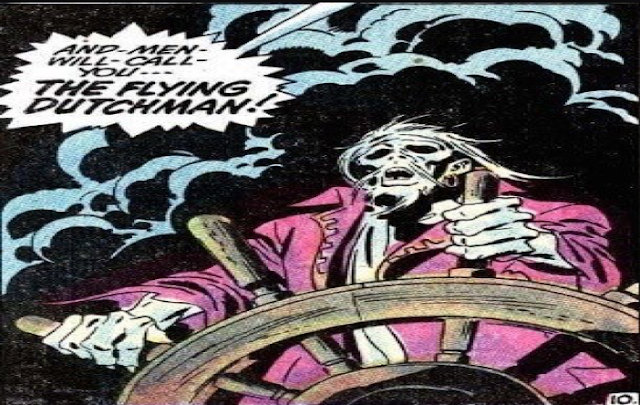 It's love and death on the high seas. The 2016 Met season is set to open with this new nautical staging of Tristan und Isolde starring Nina Stemme and Stuart Skelton as Wagner's star-crossed lovers. A perfect pair of programs at Mostly Mozart. 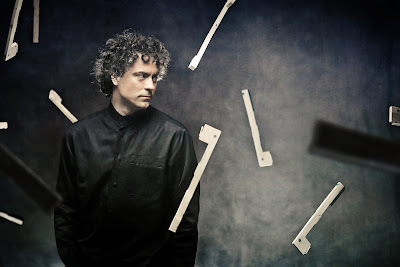 Explosante-fixé: Paul Lewis and the parts of a piano. Photo by Joseph Molina © 2016 harmonia mundi usa. The Mostly Mozart Festival is celebrating half a century of providing refuge to New Yorkers coping with the city's erratic August temperatures with air-cooled concert halls and skilled performances of classical and early Romantic repertory. Two of those programs were on offer Tuesday night, with the Mostly Mozart Festival Orchestra offering their first symphonic concert at David Geffen Hall this year, and Paul Lewis playing Schubert and Brahms upstairs in the elegant glass confines of the Stanley H. Kaplan Penthouse. Seven great works from the genius who changed the world. Somewhere around three-quarters of the way through the ten articles lay month chronicling the life and major stage works of Richard Wagner I started thinking about who I was going to write about next, I thought for maybe ten seconds and decided that the next composer in our spotlight will be Mozart. Bel Canto at Caramoor mounts Beethoven's Fidelio. 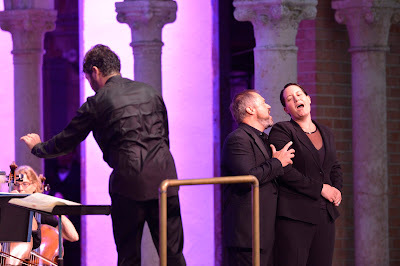 in Fidelio at Caramoor with Paul Groves (center) as Florestan and Elsa van den Heever as Leonore. Photo by Gabe Palacio © 2016 Caramoor Festival of the Arts. Since its inception, the Bel Canto at Caramoor program has focused on providing opportunities for young singers and reviving rare operas, usually in Italian but occasionally in French. On Sunday afternoon, with Orchestra of St. Luke's music director Pablo Heras-Casado on the podium in the Venetian Theater, the summer festival offered Fidelio, the only completed opera by Ludwig van Beethoven.